More than just the brutality of the crime – the double murder of her father and stepmother with an axe – or the socioeconomics and the setting and the fact that it shocked New England high society in 1892, the reason that the Lizzie Borden saga has captured our attention for over a century is the exact same reason that she was acquitted of the crime. Namely, because – whether back then to an all-male jury or even today given the gender of most killers we see on the news – it’s damn near impossible to compute how a girl could evolve from "sugar and spice and everything nice" to "Lizzie Borden took an axe." Yes, even nursery rhymes couldn't resist an homage to Borden's "forty whacks." A longtime passion project of producer and star Chloë Sevigny, this daring feminist retelling of one of America’s most notorious murder mysteries sets out to answer those questions and also capture, as producer Liz Destro reveals, "the loneliness of being an educated and ambitious woman at the time." Working in a number of theories from a wealth of Borden biographies Sevigny gave her screenwriter friend Bryce Kass as well as details gleaned in a visit to Borden's home and community of Fall River, Massachusetts to lure him aboard the project, the subsequent film from The Boy helmer Craig William Macneill manages to do the same. With cinematographer Noah Greenberg's "slow, creeping zooms that create a sense of claustrophobia" captured on vintage lenses that give even the darkest of subject matter an intentionally softer, John Singer Sargent-esque painterly feel, we feel as though we've stepped back in time and into Lizzie's shoes. Purposely framing characters off to the side and taking the corners tighter voyeuristically, in the words of Greenberg, "as the camera follows Lizzie throughout the house," we get the impression that the walls are closing in on Borden to the point that even when the most likely undiagnosed epileptic woman isn't having an attack, it feels like she could at any moment. Reminiscent of the way that as Chloë Sevigny notes "women of the time...were virtual prisoners in their homes," under what she reinforces and the film implies through the characters of Lizzie's domineering father and uncle as "patriarchal rule," for Lizzie Borden, "the only way to get out of that house was marriage or death." Deemed an old maid at age thirty-two (similar to her older sister Emma, played by Kim Dickens), when the headstrong Lizzie manages to twist her strict father's arm long enough, an occasional evening out at the local theater has become her one reprieve, even though it's frowned upon in society to go out unaccompanied. A lonely outcast who spends the rest of her time with her birds, reading, or reading to her birds, Lizzie gets a friend where she least expects it with the arrival of Bridget Sullivan, a young housemaid played by Kristen Stewart. Cutting right through their differences in class or status, the women only grow closer as they feel the metaphorical noose tighten around their necks in a house run with fear and abuse by Andrew Borden (Jamey Sheridan). And while both actresses are outstanding, without the benefit of much dialogue or a character nearly as well-documented as Sevigny's nonetheless richly complex Lizzie, in the hands of another, the subservient Bridget could've easily been overpowered by Sevigny. Yet, creating a fully realized individual, Stewart – incidentally the first person they imagined in the role – turns in one of her strongest recent performances as the housemaid whose relationship with Lizzie surprises them both when it turns romantic. From anonymous threatening notes to a shady uncle, although red herrings abound as we lead up to the double murder and Macneill and Kass throw the audience a few curve balls in various subplots (including some that either feel contrived or don't go anywhere), Lizzie isn't afraid to take an absolute stance on the crime itself. Leaving ambiguity in the past, in a bravado sequence that not only commands the viewer's attention but is also worthy of greater feminist analysis, the film – which opened with the discovery of the crime before backtracking six months – dares to go back in time once again after Lizzie's arrest, wherein we see the way the murders were carried out within this particular version of the tale. 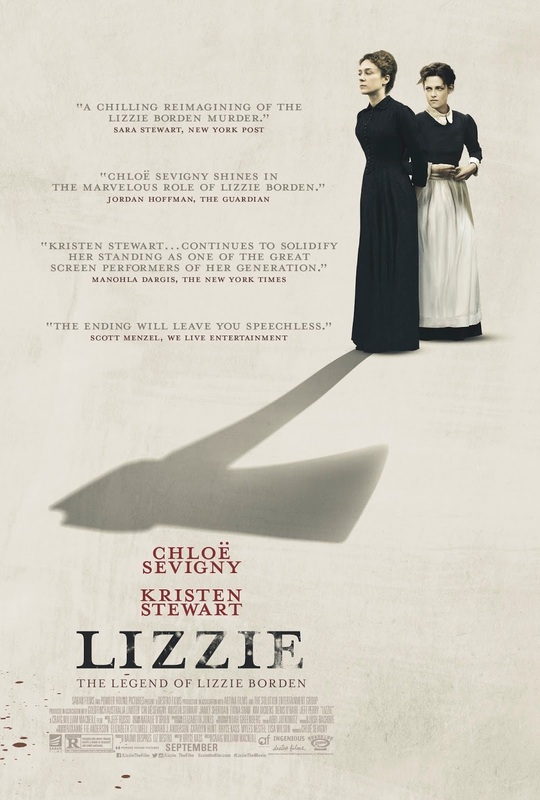 A jaw-dropping finale, unfortunately, despite the high caliber performances and gorgeous cinematography, Lizzie stumbles greatly in its pacing. Succeeding a little too well in establishing Borden's home as an intellect draining prison, needless to say that for a movie about a legendary suspected axe murderer, it's a bad sign when the only one hundred and five minute film nearly put this viewer to sleep twice. In a missed opportunity to augment its thesis even more, aside from a few cursory scenes, Lizzie largely overlooks the points-of-view of the other women in the house from Lizzie's stepmother Abby (played by Fiona Shaw) to her sister Emma which could've helped inject the already feminist work with even greater understanding of what it was like for women in the era, beyond Lizzie and Bridget. All the same, anchored by its cast and first rate technical specs (including top notch production design which believably swapped out Massachusetts for its Savannah, Georgia location shoot), this ambitiously made, surprisingly empathetic passion project takes a literal and figurative axe to the Victorian period. I only wish it would've either done the same to the running time or spent a little more time trying to give Lizzie more life.